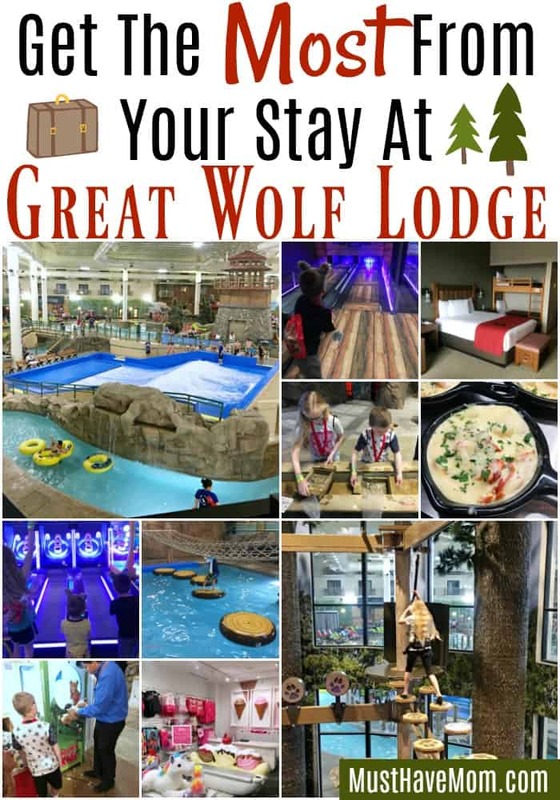 Great Wolf Lodge Bloomington, MN: Guide To Maximize Your Stay! 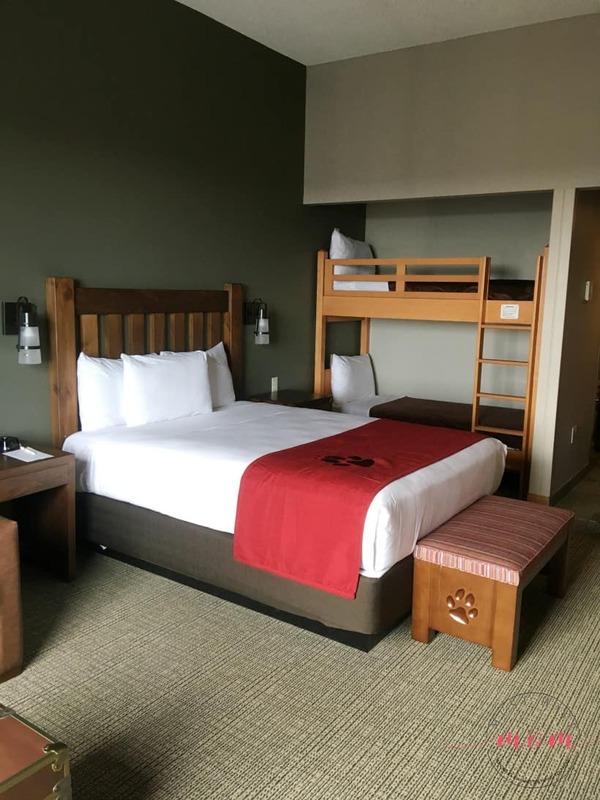 We checked out Great Wolf Lodge in Bloomington, MN, which is a new location, to see what features and amenities they had to offer. 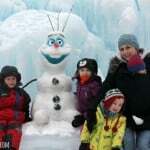 We were blown away and would recommend this hotel for any family that loves to have fun! I’ll show you what we loved and how you can get the most out of your stay. 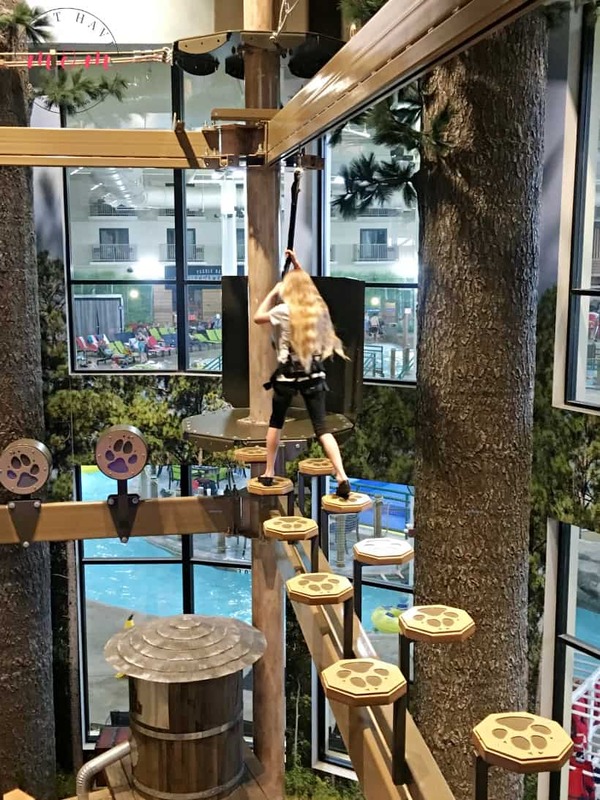 As a family of six it can be hard to find a hotel that will accommodate our entire family in one room (with a bed for each person), and the Great Wolf Lodge in Bloomington, MN achieved that and even included SIX waterpark wristbands with our stay. Right out of the gate they were high on our list of best family-friendly hotels. From there, our stay just got better and better. 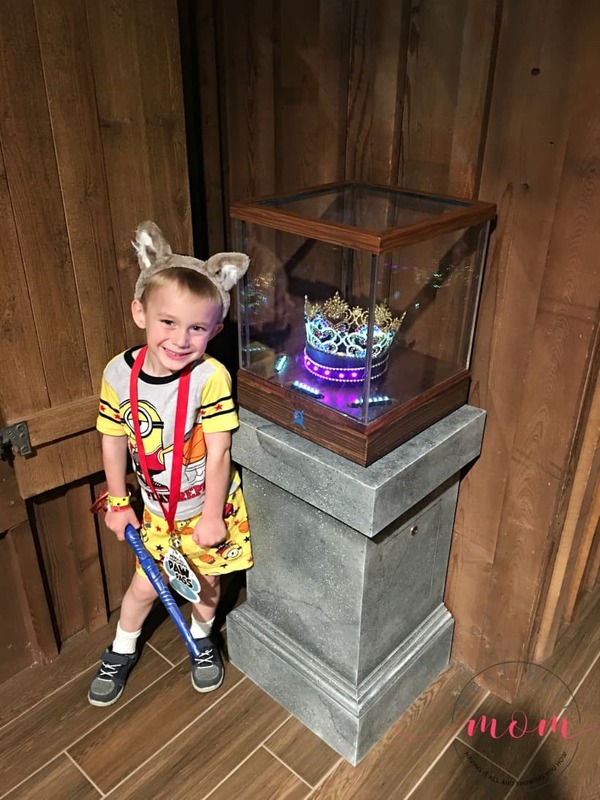 When you check in each of your kids will also receive a pair of wolf ears! For those of you that have 3-4 kids you’ll find the deluxe bunk bed suite with a queen bed, pull out sofa and bunk beds to be the best value for your stay. Our kids adored the bunk beds and we thought it was a super convenient sleeping arrangement. Our younger kids slept on the pull out sofa and the older two slept on the bunk beds. The room was spacious enough that we didn’t feel cramped and had plenty of room to sprawl out. They also have larger suites that are perfect for large families or even family reunions! They have many different size options when it comes to their suites and by far the best selection and flexibility I’ve seen at any hotel. This hotel was previously the Waterpark of America and has since been taken over by Great Wolf Lodge. This is not a simple name change though folks! Everything about this hotel has been upgraded and added to! We were floored at all of the activities they have added and how much fun we had. 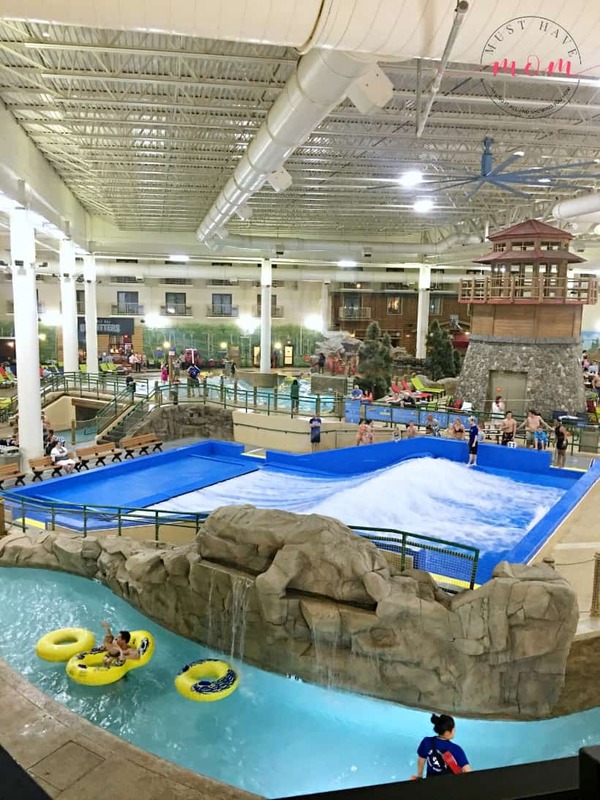 The highlight of your stay at Great Wolf Lodge will undoubtedly be the waterpark. Waterpark wristbands come free with your room for each of the people staying with you. One thing I love about Great Wolf Lodge is that they only allow hotel guests to use the waterpark. Previously when this hotel location was Waterpark of America we would stay and they allowed anyone to use the waterpark. This made for long lines and it never failed that a busload of kids would pull up every time we stayed. 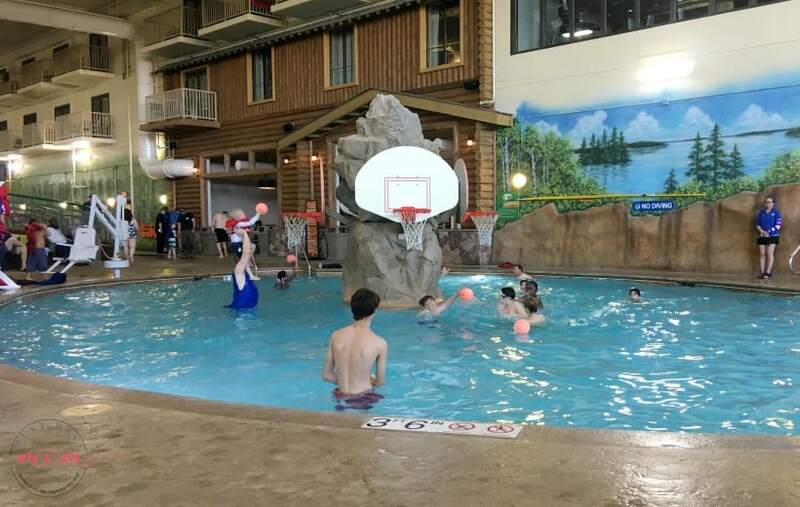 Big kudos to Great Wolf Lodge for only making the waterpark available to hotel guests as it has greatly cut down on the congestion in the waterpark and the lines are short and move fast! River Canyon Run: This is a family waterslide in which you sit on a tub (with a bottom) that seats up to five riders. You get to choose your interactive experience with Splash Cinema before your slide. We tried this ride out and found that our 4 and 6 year old sons were too scared by it. I’d recommend it for older kids or adventure seekers as the tube will take you high up the sides and makes for an adventurous ride. My oldest (10 years old) thought it was the best slide in the waterpark! Wolf Rider Wipeout: This fun surf simulator gives everyone a chance to catch a wave! We tend to think this ride is best for teens and up, however, we saw many young kids trying it out! This one will depend on the adventure level your child is at! My husband on the other hand, loved it! We also recommend avoiding bikinis on this ride! Alberta Falls: This fun tube slide allows riders to ride a single or a double tube down the twists and turns. You go down four stories and come out into a splash pool at the end which hooks up with Crooked Creek and also leads to the wave pool. Even my youngest child (4 years old) loved this waterslide as long as we went tandem. 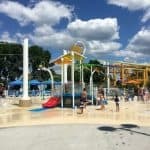 Fort Mackenzie: This huge waterpark treehouse features slides and water galore. This is perfect for the youngest of kids all the way up to elementary-age kids. With small waterslides, a giant bucket that dumps water, water spraying features and tons more, there is SO much to do. Grab a lounge chair and hang out poolside while you supervise the kids. 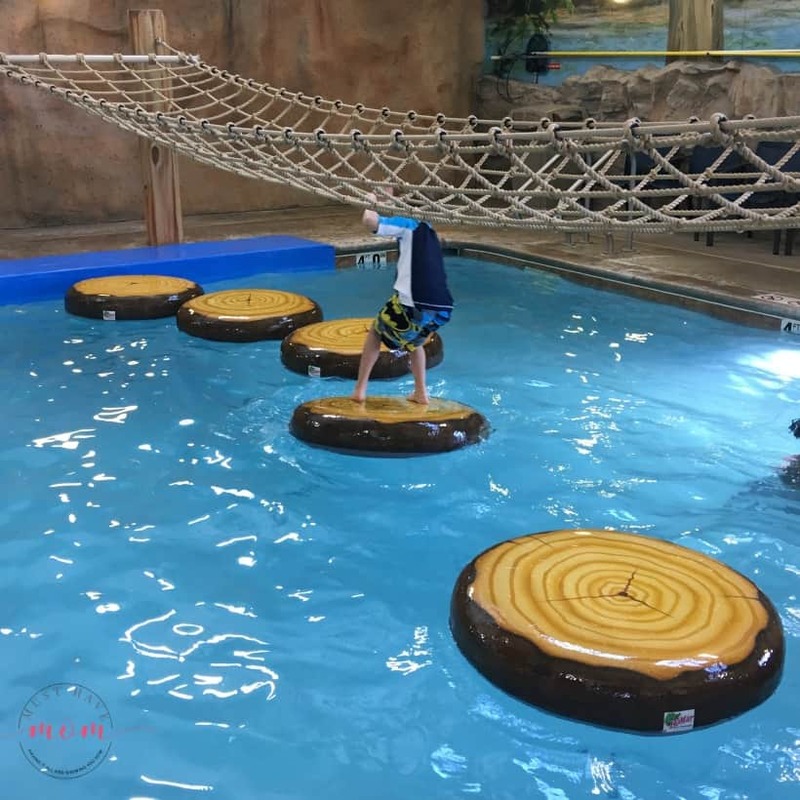 Big Foot Pass: This water challenge features a net suspended above anchored floating lily pads that your child can cross. This was my son’s (8 years old) favorite attraction in the waterpark. Chinook Cove: This fun pool gives kids (and adults) a change to swim, play basketball and splash. It’s a nice place to slow down and enjoy swimming. Crooked Creek: Grab a tube and float around Crooked Creek when you want to slow down a bit. It weaves all the way around the waterpark and even goes through the wave pool! Watch out for the waterfalls though or you’ll get wet! Slap Tail Pond: In Slap Tail Pond you’ll find a huge wave pool complete with giant waves! Swim through them or grab a tube and ride it over the waves. The wave pool isn’t always active and starts up in intervals. My kids loved this feature! Otter Run: These body slides twist and turn for family fun. When we visited these were closed for maintenance so we didn’t get to test them out! They look like a ton of fun for all ages. Smaller kids can ride with a parent supervising at the top or bottom and wear a life jacket. Does Great Wolf Lodge Provide Towels? Yes! When you enter the waterpark you simply give your room number and you can have free towels. Trade them in when they get wet and get nice, dry towels! Return them before you leave the waterpark or you’ll be charged a $10 fee. Is Great Wolf Lodge Fun For Adults? Yes! My husband and I had an absolute blast at Great Wolf Lodge. In the waterpark you’ll love the wave pool, surf simulator, family waterslide, tube slides and body slides. Plenty for adults to do! Rent a cabana for a more relaxing experience. How Much Are Great Wolf Lodge Waterpark Passes? Great Wolf Lodge waterpark passes are reserved for hotel guests only and are free for registered guests. If you plan on having visitors while you stay at Great Wolf Lodge waterpark passes can be purchased for $50 each. The Great Wolf Lodge Waterpark might be the biggest highlight of your stay, but it won’t be the only one! There are plenty of dry land activities to participate in too. The fun never ends at Great Wolf Lodge! We were blown away by all the activities, both free and paid, that kids can participate in. Are Great Wolf Lodge Packages Worth It? Great Wolf Lodge has tons of dry land activities in addition to the waterpark and free activities. They sell various packages such as the pup pass, paw pass, and wolf pass. These package deals are definitely worth it. If you plan on doing any dry land activities you will get your money’s worth from these package deals. We had a blast going around to all the activities all weekend and completing the included activities from our pass. They make it really easy to redeem too. Kids will wear the paw pass on a lanyard around their neck and when it’s time to pay you just show your pass and they cross off the activity you are doing. They offer a pup pass, paw pass and wolf pass. Each package is geared towards a different age level. What Does The Wolf Pass Include? What Does The Paw Pass Include? What Does The Pup Pass Include? Our first stop in our dry land activity experience was the Great Wolf Lodge Creation Station. Each of my kids chose a special animal to stuff. Then they were able to step on the pedal and help fill their animal with stuffing. After that it’s time to pick out an outfit or put your new friend in the included backpack! They’ll also get a free Great Wolf Lodge t-shirt for their stuffed animal. My kids loved having a souvenir to remember our trip and of course, to snuggle with that night! The stuffed animals are $29.99 each and are included on all of the passes (pup, paw and wolf). Outfits are $19.99 each and are not included in the pass. Great Wolf Lodge Oliver’s Mining Co. This dry land activity was one of my favorites that the kids did. 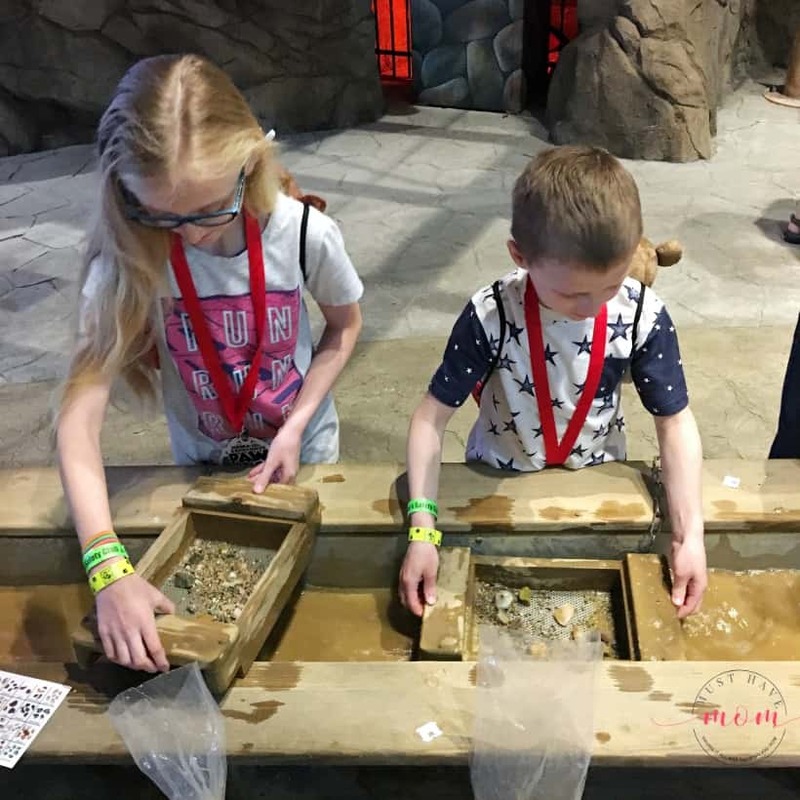 Each child receives a bag of sand to sift through and find precious stones. They also get a card to identify each of the stones. Take it over to the Oliver Mining Co. area and pour it into a sifting screen. The flowing water helps wash away the sand and reveal the stones. This was a super fun activity! You can see a video of it on my Instagram account. 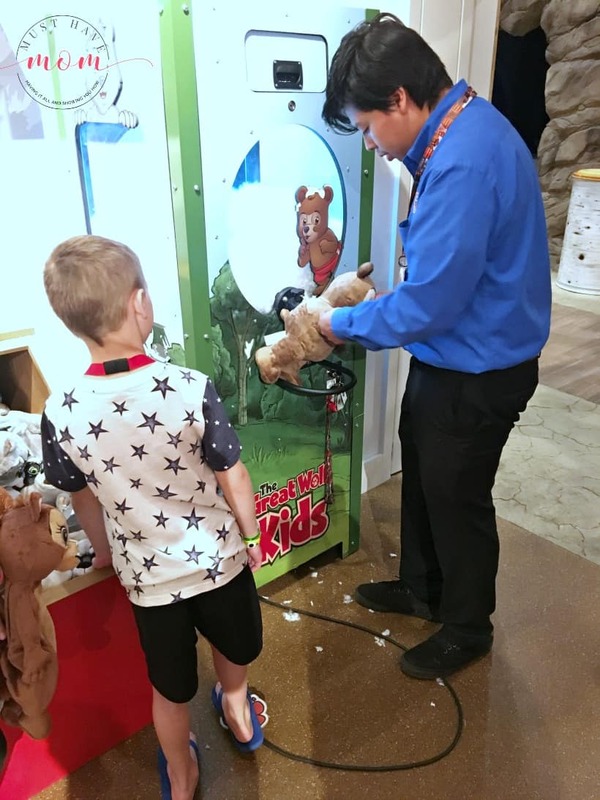 This fun activity is included in all of the passes (pup, paw and wolf). 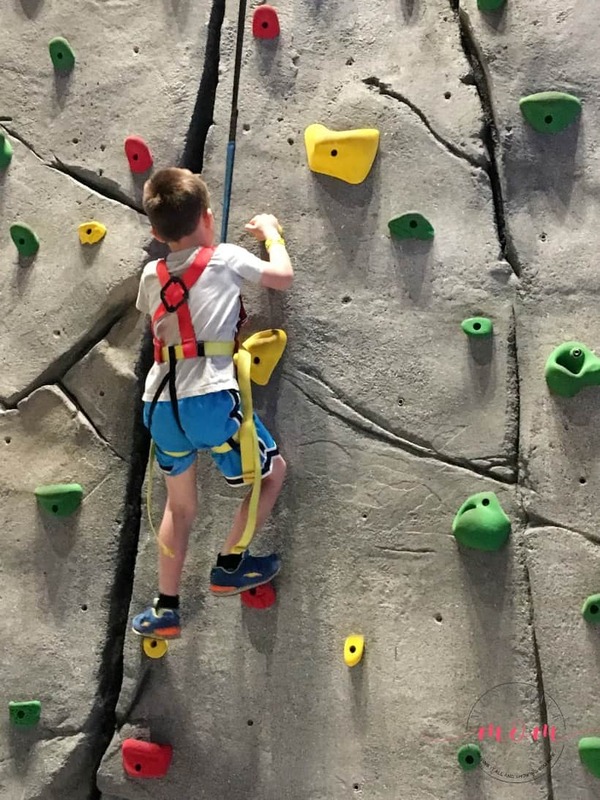 This rock wall features various levels of difficulty for kids and adults to enjoy climbing to the top. My four year old shocked me as he shimmied up the wall. My husband also enjoyed it. This is fun for the whole family. The attendants were really helpful with the kids and helped them find hand and foot holds to climb up. This activity is included in the wolf pass. 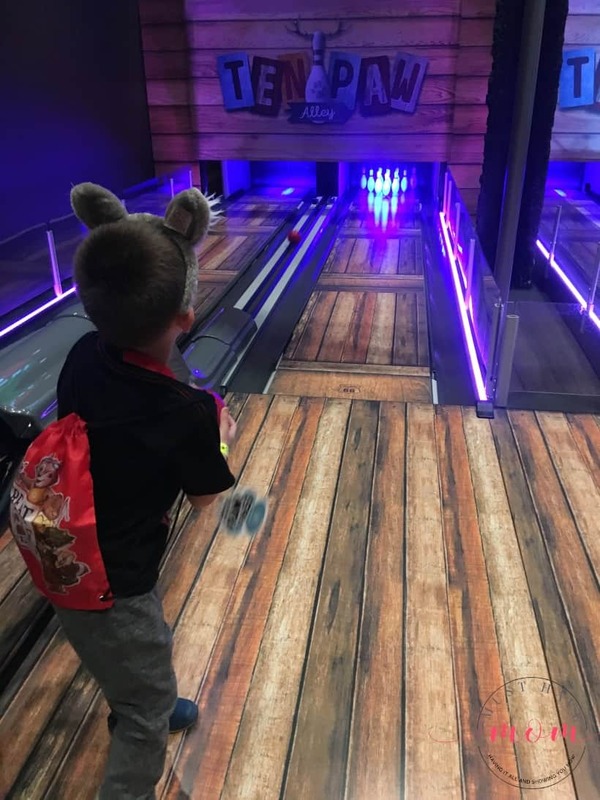 The Ten Paw Alley features half size lanes and kid-size bowling balls. My kids had an absolute blast doing this and I realized we need to go bowling as a family activity more often! Ten Paw Alley allows you to pick a theme and bowl ten frames. This activity is included in the wolf pass. My older kids (ages 8 and 10) couldn’t wait to try the ropes course. It is suspended above some of the attractions and is like a treehouse just begging you to come play. Since you have a harness on there is no danger of falling or getting hurt! My kids loved this! My husband also did it and thought it was fun! This is included in the wolf pass. Pick out a wand and magic topper and embark on a magic quest that will have you exploring the lodge to find hidden crystals and portals as you try to complete your quest! This fun activity is a great way to explore the lodge after a day of play in the waterpark. Point your magic wand at a treasure box and watch it open. Point it at a crystal and see it light up! This activity is included in the paw pass and wolf pass. 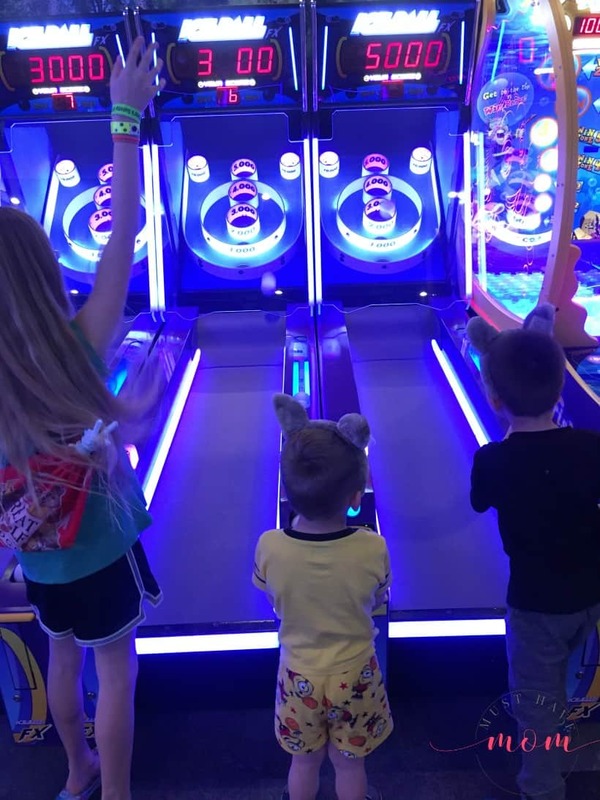 Play games and earn tickets in this fun and classic arcade! Once you’re done head over to the ticket counter and trade in those tickets for prizes! Our kids loved this and I may have played a game or two of skeeball myself! $5 paw points game cards are included in all the passes (pup, paw and wolf). 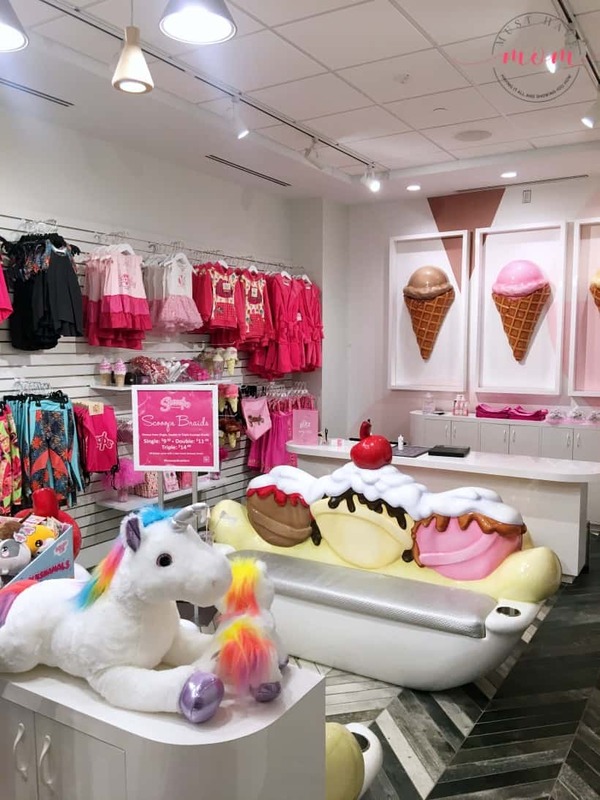 Here you’ll find every little girls dream with glitter and glitz galore! It smells amazing inside and is sure to spoil your princess. A glitz glitter tattoo from the boutique is included in all passes (pup, paw and wolf). What is there to eat at Great Wolf Lodge? The last thing you want to do is leave when you are staying at the Great Wolf Lodge. They’ve created such an amazing resort, that you won’t have to! 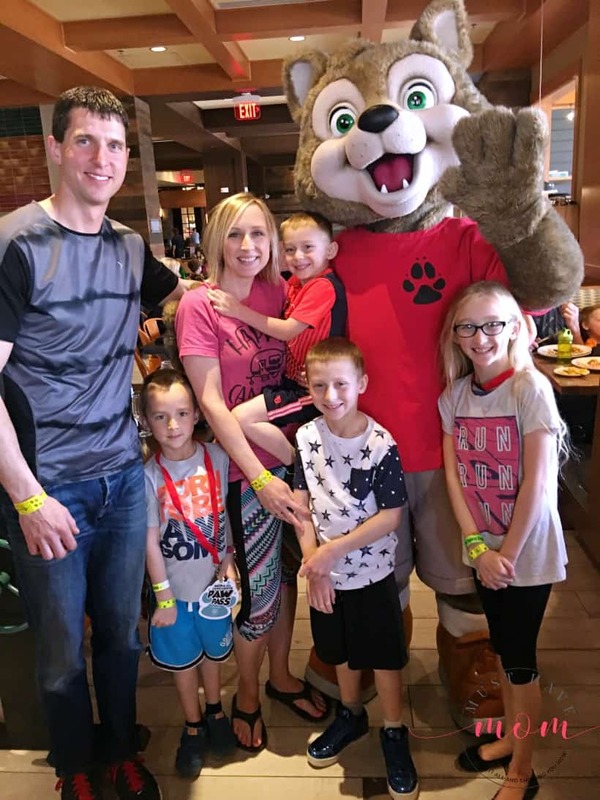 There are plenty of dining options at Great Wolf Lodge and we tried out almost all of them so we could share with you which are our favorites! This restaurant was by far our favorite! They feature an impressive menu and an amazing buffet. 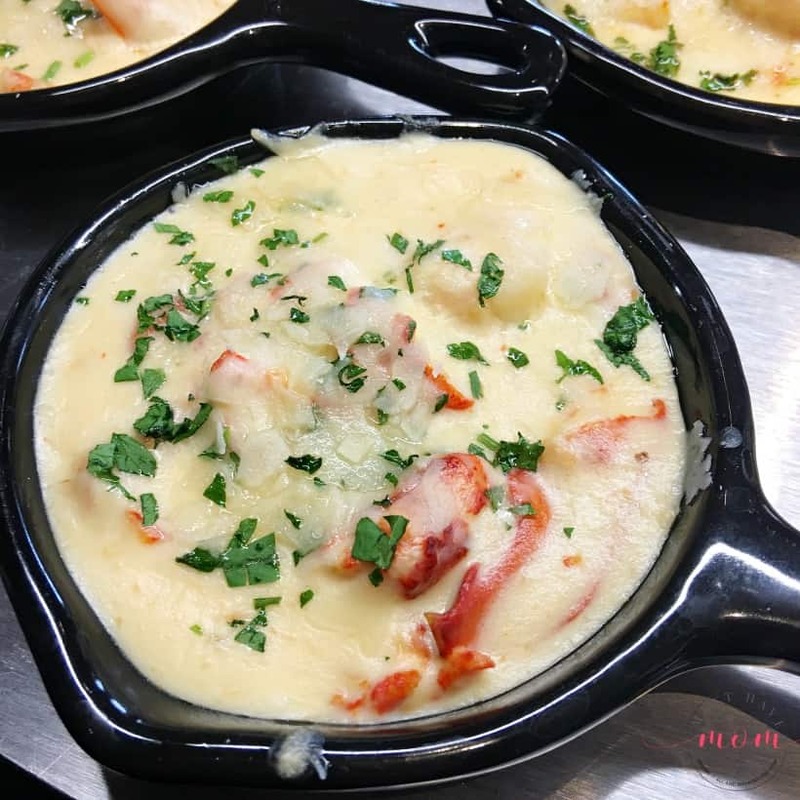 This is not your average buffet and serves a variety of amazing, high-class dishes, like the lobster and shrimp ravioli pictured above! From poutine fries to risotto and chicken, you’re sure to find something to please every family member. We were blown away by how good the food was here and we ate here multiple times during our stay. This laid-back dining experience features pizza and wings. You’ll also find salads and pasta here. We had a pizza and wings and we were really pleased. The pizza was great and we ate the whole thing! The wings were also delicious. You can sit at a table overlooking the waterpark while you dine too! This restaurant is located right inside the waterpark so your fun doesn’t have to stop when you need to refuel. We stopped for a snack here and loved their big soft pretzels and their house-made salsa with tortilla chips. Barnwood offers all the best in small, shareable plates and craft cocktails in a fully themed rustic setting. This was the only restaurant we didn’t test out during our stay. At Great Wolf Lodge, all their culinary teams are well versed in common food allergies and dietary restrictions. They are more than happy to accommodate your needs, and they encourage you to speak to your chef, so your meal can be prepared safely from the very beginning. 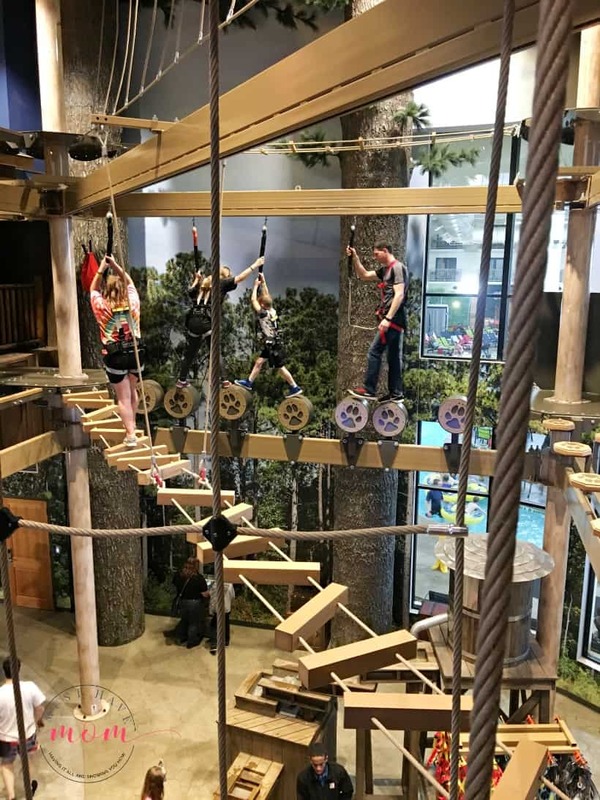 Great Wolf Lodge does not use or serve peanut or tree nut products, but some of their products may be manufactured in facilities that also process nuts. If you’d like to discuss your dietary needs before your stay, please email them at food.minnesota@greatwolf.com. Of course, what’s a kid’s dreamland without a candy store? 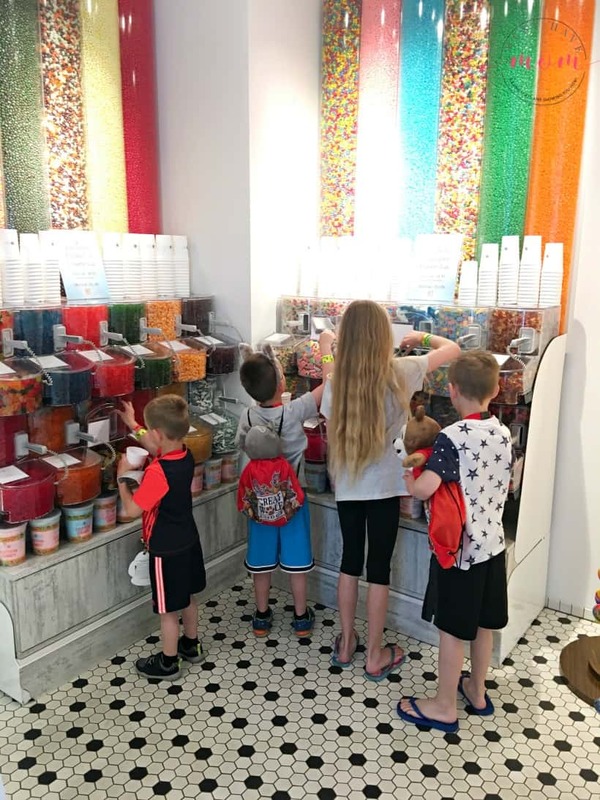 We made a stop to the candy store and our kids were in heaven choosing all their favorites in a cup! One candy cup is included in all of the passes (pup, paw and wolf). Great Wolf Lodge has a Ben & Jerry’s inside the resort. Our favorite way to end the day was with a trip to Ben & Jerry’s for some s’mores ice cream in a waffle cone! They have a variety of treats and everything we tasted was fantastic! You’ll also find a Dunkin’ Donuts right across from Ben & Jerry’s. It was always bustling and had amazing donuts and coffee. Try the coconut coffee, it’s amazing! As you can see there is a TON of stuff to do at Great Wolf Lodge. In order to get the most from your stay, I recommend staying at least two nights. One night just isn’t long enough to do all of the activities. I would also recommend buying a pup, paw or wolf pass for your child(ren) depending on their age. It’s the best way to experience a variety of activities at the best possible price. All of the activities we did were so much fun and really made our stay magical. Plan to spend a good amount of time in the waterpark, but make time for the dry land activities as well. We spent time in the morning and at night doing the dry land activities and filled our daytime hours with the waterpark. Eating lunch at Buckets restaurant will ensure you don’t have to leave the waterpark. Rent a locker if you want to bring your phone or other valuables with you so you can enjoy the attractions without having to babysit your stuff. Find some chairs to relax in and leave your towels on them between relaxing and attractions. Remember to return your towels before you exit the waterpark. Visit Campfire Kitchen for their amazing dinner buffet. If you want to save money on meals then I suggest bringing fruit, cereal and muffins for a breakfast in your room. Breakfast is the easiest meal to plan ahead for and the room includes a fridge and microwave. Plan to eat dinner in the hotel. We also find it really helps to bring a case of bottled water with us so we always have enough drinking water. Great Wolf Lodge is all about making the guest happy so if there is anything you need or want, just ask! They are more than happy to accommodate you and your family. We were really pleased with our weekend stay there and will definitely be returning. *I was not compensated for this post and our stay was not free. I received a discounted media rate. 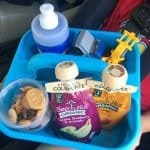 The BEST Travel Snack Hacks For Kids! 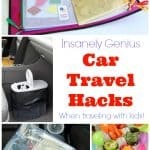 Do THIS Before Your Next Road Trip! We were just at the one in New England this past weekend. There was SO much fun stuff to do there. That’s great to hear! Thanks for sharing your experience at the New England location. We had the pleasure of staying at our local MA GWL this past weekend and it is fun to see the similarities and differences. It is so fun and I cannot wait to go back!! Oh I would love to visit multiple locations and compare!! How fun! I have always wanted to go to the great wolf lodge. It looks like so much fun. I just know my girls would have a blast there. The one in bloomington isn’t that far from me either. I’m in Wisconsin and travel that way often. It is definitely worth the drive! We had a blast!! I hope to make it to a Great Wolf Lodge property. There are always so many families I know who get to go and have the BEST time! We love Great Wolf Lodge. It’s a blast and it’s a self-contained vacation (for us in Dallas). The little kids love it. The big kids love it. The parents love it. Yes, it really is it’s own vacation! We were blown away by all they had to do! My son loved the Great Wolf Lodge! We had such a great time there! We love going to the great wolf lodge. Our boys would move there if it let people become residents. We have never been to a Great Wolf Lodge but they look like so much fun!! Perfect for kids! I’ve heard so many great things about the Great Wolf Lodge. It looks like such a fun place to take kids and would be a great destination for a summer vacation. We have stayed at a Great Wolf Lodge before and had the most awesome family vacation! There is so much to do that everyone feels satisfied with their time spent there. Lots of wonderful memories too! That is great to hear Dawn! We found we felt the same way. They really do a great job with it! My kids have been begging me to go back to Great Wolf! This looks like a great location! Haha I can relate! My kids were asking to go back before we even left 🙂 So much fun! I knew there was one at the Dells, but didn’t realize a similar one was in Minnesota also! It looks as fun as the Dells one! Yes! It actually just opened up recently. It’s so much fun. I haven’t been to the Dells but it’s on my list of places to visit!